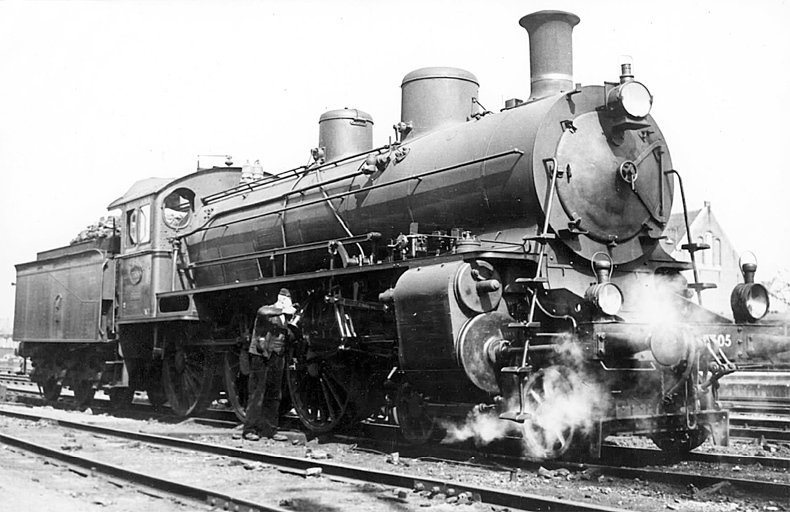 This class was originally built for the Swiss federal railways from 1907 until 1915 as class A 3/5 600 as a mixed service class. The four prototypes were built in 1907, two with a three cylinder and two with a four cylinder arrangement. Apparently this design choice was subject to discussion and obtaining field experience had to bring the decision. The production of the series commenced in 1910 and comprised the four cylinder compound version. These engines differed in various details from the prototypes. The engine delivered 1500 hp and were able to pull a 350 ton train up a 10‰ incline at 50 km/h. The Dutch government in exile foresaw the large scale destruction of the railway system by the end of the war. To help restoring normal order as quickly as possible it sought to obtain new steam locomotives from Sweden. In addition to that surplus supplies were obtained from various sources. The A 3/5 600 class had been in store in Switzerland for several years due to the progressing electrification and a purchase of 22 A 3/5's was concluded. As soon as international conditions permitted the loco's were transported to the Netherlands and quickly put into service from 1946 on. They performed reasonably well but the Dutch engineers disliked the loco's not being used to operate a compound engine. Due to its gold coloured band at the base of the chimney they were nicknamed "gold finch"
When repair of the war damaged Dutch steam locomotives progressed the 3500's were relegated to minor services and gradually withdrawn from service. Scrapping started as early as 1948. By 1952 the last one was gone. Unfortunately none of the class was preserved neither in the Netherlands nor in Switzerland. In 2016 it dawned on me that I never saw one again since! So it came on my search list. I visited several shows and on Eurospoor 2016 I stumbled upon one. I was so amazed that I first did not realise what saw. At a price of €100 the purchase was quickly decided. New examples now currently go for over €300! The model has some minor damage, the original box was with it but somewhat damaged and the bag with parts was missing. All in all nothing that is beyond my abilities, although I do need to work on it. The smokebox door betrays its Swiss origins. The steps have come loose on both sides. Something to correct..